When it comes to sending large files, you can’t just settle for mediocre online file transfer services. You need to make sure that you’re using a service that’s not only secure and reliable but also fast enough to deliver the files that you want without any annoying glitches. Speaking of which, Infinit is a new peer-to-peer file transfer application that simply wants nothing but to provide its users with a better and smarter way to send and receive files. Let’s find out if it can actually live up to your expectations. Infinit is a full-featured file sharing desktop application that is currently available on Windows and Mac OS X. It also uses advanced peer-to-peer technology to allow users to quickly send, share and download files. What’s great about this service is that it’s free plus, it allows unlimited file sharing. You can also send and receive any type of file may it be a document, video, photo, MP3, PDFs, etc. When I tried the desktop app’s Windows version (which is currently in beta), it lacked stability as it kept on crashing every time I try to upload and send files via link. Thankfully, I got a prompt response from their technical support. The problem was immediately solved. The desktop app lacks advanced options for user settings and configuration. For instance, users can’t set a different file path for downloads. There’s also no way to clear the log for links and file transfers. It’s important to note that Infinit aims to provide a faster and more efficient way to send files of any type or size. It focuses on productivity with the aim to complete a standard file transfer in just a matter of four seconds. With regards to this, I got the chance to try the Windows version of the desktop app. Since it’s still in beta, I already anticipated that it might crash or force close at a certain point. Well, it did but the problem was eventually solved thanks to their prompt technical support. As for how the app works, I find it really easy to use. After downloading and installing the desktop app, you will be required to log in to your Infinit account first. If you’re not yet registered, you can simply register for a free Infinit account by providing your name, email and preferred password. After logging in, the app will be immediately placed to your system tray area so it’s non-obtrusive. It silently runs in the background. Just use it when you need it. It also offers two simple ways for sending files. 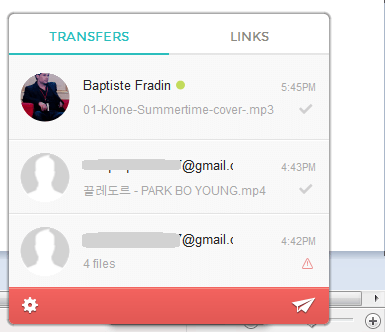 First, you can send files via direct file transfer. If your recipient is also using Infinit, then you simply need to search for his or her name then send the file that you like. 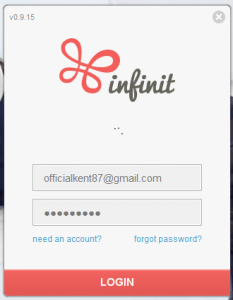 If your recipient is not using Infinit, then you can opt to send or transfer the file via email or via link (Share URL). Just drag and drop the file/s that you want to send then copy the link to your clipboard. You may then send the download link via Facebook, Twitter or instant messenger. Another feature that I like about the said app is that it supports auto-resume and multiple file transfers. You can send or share multiple files at once. Plus, there’s no limit to the number of files that you can send. You can also send files of any type and size. This makes Infinit a perfect choice for sending large files including videos and high-res photo albums and ZIP archives. All in all, I can say that Infinit is a really good file sharing/file transfer service. It may still lack in certain aspects but performance wise, it’s already good enough to meet your needs and demands when it comes to fast and efficient online file transfers. If you’re looking for a fast and reliable desktop application for sending files (especially large files), I highly recommend that you try Infinit. It’s available for free for Windows and Mac OS X users. It also flaunts a slick, non-obtrusive and user-friendly UI. So go ahead and check it out.